360 Cookware is unlike any cookware you’ve ever experienced. This energy efficient cooking system moves beyond traditional cooking and captures the magic of Vapor® Technology to heat your food quicker, at lower temperatures and without added fat or excess water, ensuring recipes stay nutritious, flavorful and appetizing. Vapor Technology creates fast, even heat that gently surrounds your healthy recipes, from vegetables and meats to grains and baked goods. The lids are specially designed to create a Vapor® Seal that captures heat and keeps it moving around your food, not escaping out the sides. 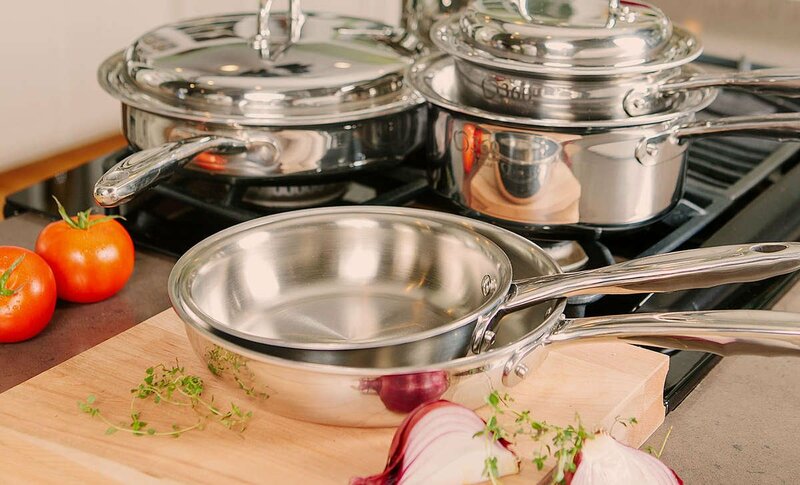 Our stainless steel cookware is made with the highest quality stainless steel, so it is built to last, and all of our products come with a lifetime warranty so you can enjoy the energy saving benefits of green cooking and better tasting food as long as you’d like. 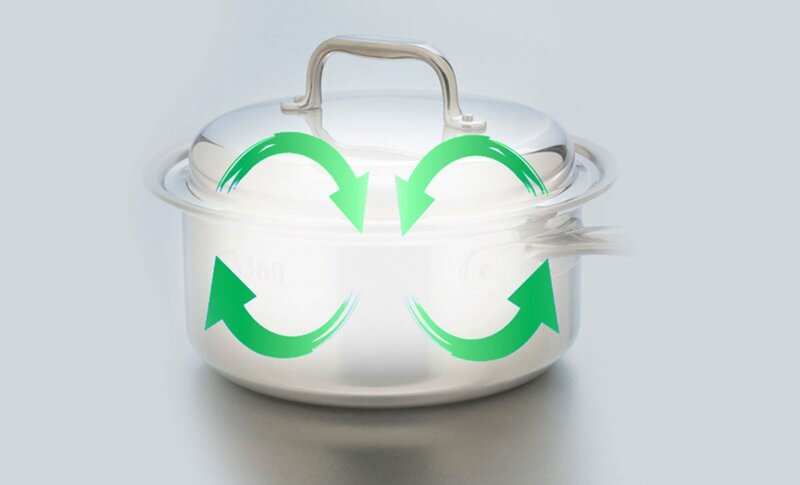 360 Cookware is made of three primary metals. The inside layer (what primarily touches your food) is T-304 Surgical Grade Stainless Steel and the range is 18/8 to 18/10. “Range” (18/8 and 18/10) refers to the percentage amount of chromium and nickel in the metal. In this case, it’s 18% chromium and 8% to 10% nickel. The outside layer (what touches the heat) is T-400 series stainless steel which has a lower nickel content and high carbon steel content to interact on induction cook tops. These two layers of stainless steel surround a layer of aluminum, which ensures superior heat conduction. What makes 360 Cookware different? Customer focused – Our goal is to ensure each customer receives quality service and gets the most from their cookware. Each customer becomes a part of our family and receives a lifetime of unique cooking experiences. Vapor® Cooking – Our cooking technique uses the natural moisture from meats and vegetables to cook food instead of unhealthy additives or water which strip the food of valuable nutrients. American Made and American Owned - 360 Cookware is manufactured by Americraft in West Bend, Wisconsin, USA. Sustainability – Our stainless steel cookware is manufactured using a sustainable process leaving NO carbon footprint on the planet. In addition, the fact that the utensils will last for many generations reduces waste and the construction allows you to use less water and energy. Our products promote a sustainable lifestyle from the plant to your table. What about layers? How many “plies” does it have? If you’ve done a little cookware research, which we SO hope that you have, you’ve probably heard a few different terms relating to how many “layers” the cookware has. The fact is while stainless steel is a safe, non-porous surface that transfers no harmful chemicals into your food, it’s not a great conductor of heat. Aluminum conducts heat very well, but it can leach harmful metal into your food. Imagine these two metals as being the chocolate and peanut butter in a Reese’s® Cup. Alone they have their own pros and cons, but put them together and WOW! Once multi-ply construction was mastered and became accepted in the cookware industry, marketers had to find a way to make their brand seem better, and the race to see who had the most “layers” was on. The problem with this sales tactic was it misinformed consumers — it’s not the number of layers that matter, it’s the thickness, or gauge. 360 has one of the thickest measurements at .11″. This cooking method is arguably one of the best-kept secrets in the food preparation industry. The premise is quite simple – construct the cookware to retain heat and moisture, and build it to operate at lower temperatures. The result is food that cooks faster, in its own juices, requiring little to no additives. Food tastes better naturally, nutrients are retained and you receive the benefits that nature intended. Do you have to cook using the Vapor® Cooking Method? Absolutely not! One of the many benefits is that it allows you to cook as you always have, if you so desire. The Vapor® Cooking Method is a feature that can be used to enhance your current menu. When using the Vapor® Cooking Method, you are able to remove oil, butter, lard, etc. from your cooking process. This small change could remove over 1500 calories from your diet each week. In addition, cooking vegetables without water retains vitamins and nutrients that you are currently pouring down the drain. You can also cook foods at lower temperatures, which further reduces the chances of losing valuable nutrients. 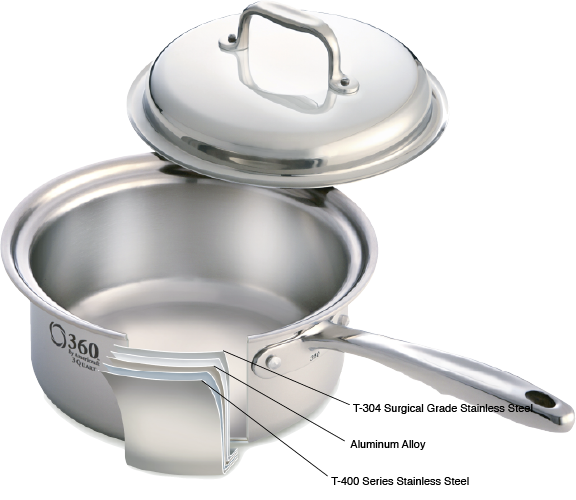 360 Cookware is a different kind of cookware for every kind of cook. The brand was developed in an effort to share this century-old technology with the masses. Our story resonates with consumers from varying walks of life and is a reflection of our leadership. We believe you should do the right thing because it’s the right thing to do.